Bartholomew has always enjoyed playing basketball and being active. Exercise science was the perfect fit for him. TJ Bartholomew is a third-year exercise science student from New York City. Sports and exercise are very important to Bartholomew, which is why exercise science was such a great fit for him. 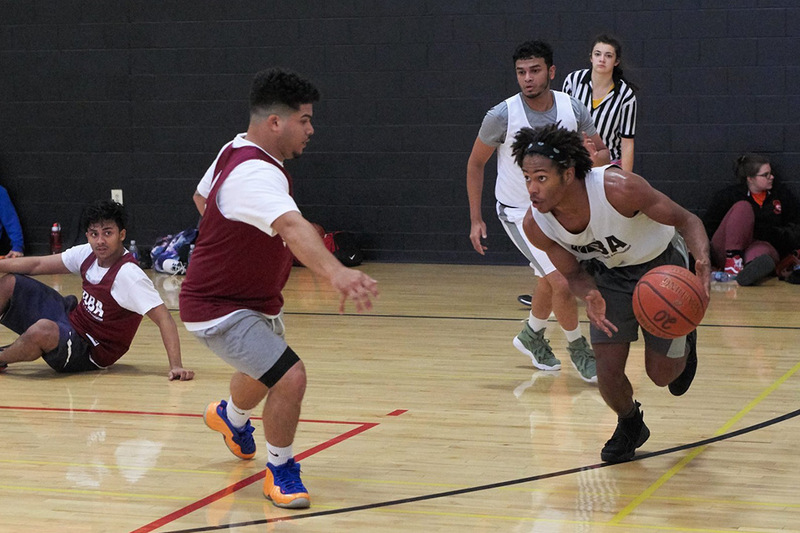 Outside of classes, he enjoys playing basketball and is involved with the Deaf Basketball Association of Rochester, an intramural sport at RIT. He is also a member of Men of Color, Honor and Ambition and enjoys reading and exercising on his own during his spare time. RIT began offering this degree in 2016, giving students the opportunity to study the growing field of exercise science and learn about issues dealing with health, fitness and human performance through a scientific lens. Within the program, students can choose between the clinical or athletic tracks, the first focusing on clinical exercise medicine and the second focusing on athletic conditioning and training. To learn more about the degree program, go to https://www.rit.edu/programs/exercise-science-bs. Question: Why did you choose to major in exercise science? Answer: Initially, I was in the laboratory science technology program at NTID. I really liked the program, but I realized that laboratory science wasn’t really something I wanted to do. Someone told me I should change my major to something that would be more challenging for me. I always enjoyed playing sports and different activities, so I thought I would try exercise science and see if I liked it. Question: Why did you choose the athletic track of the program? Answer: I love athletics because I like being active and have lots of experience playing sports. I chose the athletic track to learn more about personal training. The clinical track is more about the medical side of exercise science, and I’m not as interested in that. Question: What types of classes and work do you do for this major? Answer: We take classes like anatomy and physiology, fitness prescription and intro to exercise science, which helped me figure out what type of career I was interested in. I do a lot of work with people, not just book work. In fitness prescription, for example, we work with volunteer clients so we can learn what it is like to train and work with someone who needs help. Question: In your opinion, why is it important to study exercise science? Answer: Exercise science is a growing field. Just as an example, in some middle schools and high schools, physical education courses are starting to be shut down. We need to make sure Americans are in shape and stay healthy. It’s important to help people live healthier lifestyles, and I like to think that my work in exercise science helps people out. Question: So far, what has been your favorite class you’ve taken for this major? Answer: I really enjoyed anatomy and physiology and fitness prescription. Anatomy and physiology is a hard class, but it’s really important to learn about the muscles and parts of the body so you know what parts of the muscle you need to focus on when training. It’s really useful once you learn it. In fitness prescription, I liked being able to work with a person and learn about their goals and objectives and what their end goals are for training. From that information, I can help them be successful in their plan by looking at their daily schedules, commitment and performance during their training. Question: What type of job are you hoping to get after graduation? Answer: Either something related to biomechanics or personal training. If I take the biomechanics course and I’m still interested in learning more, I’ll lean that way. If not, I’ll look more into personal training.